Mode : Absolute position, relative position or both. 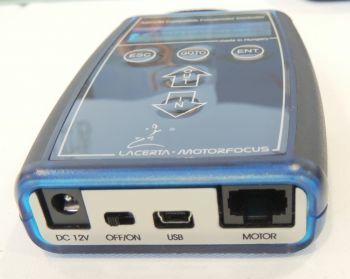 Connect to the focuser using a USB cable. The connection type is serial and by default the port is set to /dev/ttyUSB0. The default baud rate is 9600. If you change the default port, save the changes by going to the Options tab and click Save configuration. After establishing connection to the focuser, you can use the focuser control in the INDI control panel directly to move and sync the focuser. Alternatively, the focuser can be used in any INDI compatible autofocusing application. The options tab includes parameters to enable/disable logging and debugging settings in addition to polling and joystick control. The debugging and logging options should remain off unless you are to diagnose a problem with the driver. Polling: How often should the driver read the device output signals? By default it is set to 500ms or twice per second. Joystick: If a gamepad or joystick is connected, enable it to focus IN and OUT using the joystick. A new tab called Joystick is created. The INDI joystick driver must be running and connected to a supported joystick under Linux.